Here's the finished Carpenters Star. 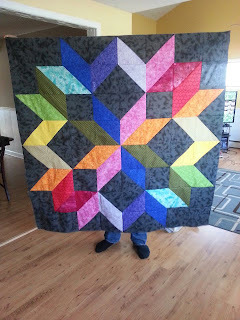 Add borders if you want, then quilt and bind. All that's left is for me to decide if I'm adding borders, or not and the quilting. I've got a few ideas on how to quilt it, just need some time. And why not you ask? Good question. Thank you Jess for helping me out. 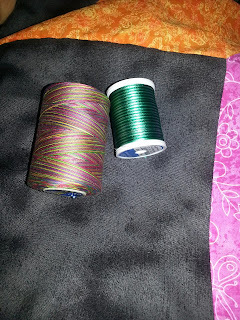 :) If the thread is all coiled up on the spool you won't get a good idea of how it would look laid out over the different colors of the quilt. What should be done is to pull some of the thread off the spool and lay it over the quilt top more or less what it would look like if it was quilted. 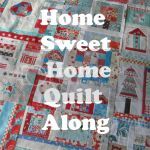 Try it on the different colors and see what works for your particular quilt top. 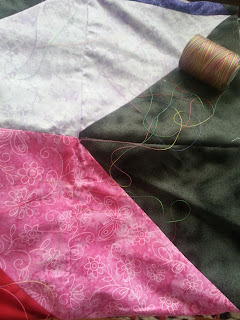 It also depends on if you want the thread to blend in or stand out highlighting the quilting.